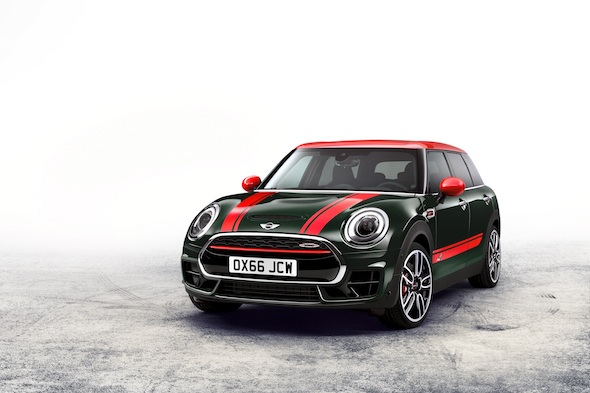 Mini has revealed the latest in its John Cooper Works line-up – the JCW Clubman. Following in the footsteps of the already-established JCW hatch and convertible models, the Clubman promises performance to a similar level, combined with its trademark practicality and all-wheel-drive capability. The model will stand out amongst its C-segment counterparts, thanks to its high-power and sporty appearance. The former is delivered by the models 2.0-litre engine, which boasts a modified turbocharger to allow for an increased output of 231hp between 5,000-6,000rpm. With an extra 39hp on the standard Cooper S, the JCW Clubman can hit 62mph from a standstill in just 6.3 seconds, before going on to reach a top speed of 148 mph. The combination of this high-powered drivetrain and Mini's ALL4 all-wheel drive system makes for an extremely effective deployment of power and provides strong acceleration in all conditions. This power is fed through either a six-speed manual gearbox or an eight-speed sports Steptronic transmission, models which will be priced at £29,345 and £30,945 OTR respectively. The new Clubman's suspension has been uprated for sportier, firmer ride and a powerful braking system has also been fitted. The JCW Clubman's eye-catching exterior is as can be expected of the JCW badge, with the rear wearing a lift-reducing wing and aggressive bumper, while the front features an equally styled bumper which also serves to assist with the additional cooling requirements of the powerful engine. In the cabin, sports seats, an Alcantara headliner, and a selection of equipment including MINI Navigation and cruise control with brake function comes as standard.